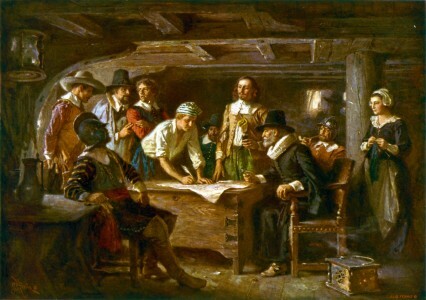 Presented in his history "Of Plymouth Plantation"
The names of those which came over first, in the year 1620, and were by the blessing of God the first beginners and in a sort the foundation of all the Plantations and Colonies in New England; and their families - William Bradford (1650). Mr. Richard Warren, but his wife and children were left behind and came afterwards. John Billington and Ellen his wife, and two sons, John and Francis. John Tilley and his wife, and Elizabeth their daughter. These being about a hundred souls, came over in this first ship and began this work, which God of His goodness hath hitherto blessed. Let His holy name have the praise - William Bradford (1650).